RWKrafts: Unity Hop - NEW Angie Girls and FREEBIES! Happy Thursday! There is A LOT going on at Unity Stamp Co today so grab a big cup of coffee and enjoy the hop and the amazing sales! SALE STARTS AT NOON CST TODAY! First is the FIVE NEW Angie Girls being released today!! I think these new girls will appeal to so many people and I'm really excited about what Angie Blom has created! I played with two of the new girls. They were great to color with my Copic markers. Ain't she gorgeous?? The stamp speaks for itself so I kept the design very simple. I colored her with Copic markers and matted the card on DCWV "Bohemian Sunrise" paper. This is definitely my favorite Angie Girl! That dog is so cute, and of course I love my puppies :) The paper is Studio Calico "Here and There". 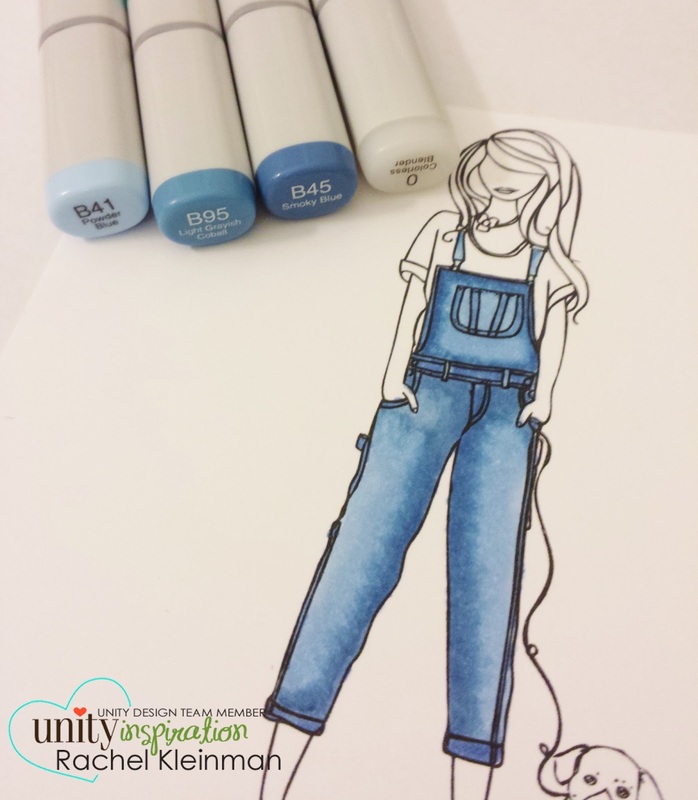 I have limited Copic colors (especially in dark blues) so I played around an came up with this Denim Copic Combo that I really like. I used B41, B95, B45, and some 0 on the edges. BACK TO THE BIG SALES! Unity is having so many promos this weekend that we're super excited about. 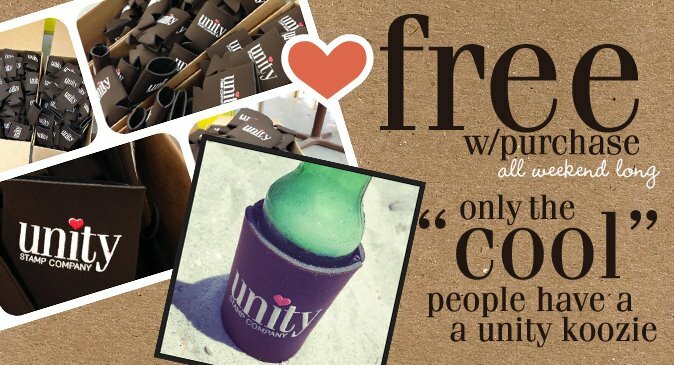 This Unity drink koozie is yours FREE with any purchase at Unity!! You know you want it. 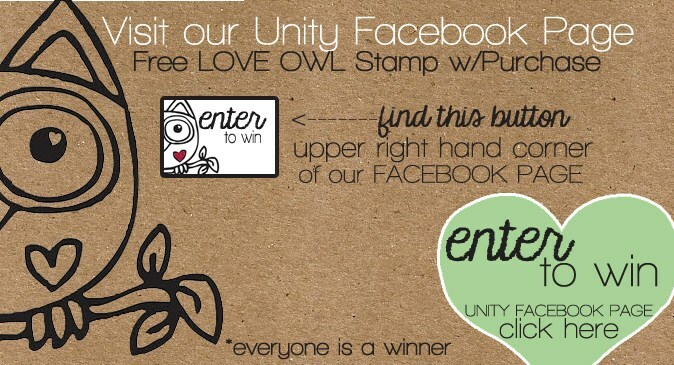 Visit the Unity Facebook page and find this little owl image, click it to be added to the Unity Newsletter, and you will get the owl itty bitty stamp FREE! SO MUCH FREE HAPPENING THIS WEEKEND! There are also two more awesome promos going on at Unity so make sure you head on over and shop! Make sure to leave comments throughout the blog hop today, there are TWO PRIZES being given away for commenters!! Your next stop is the amazing Shilo! Both cards are LOVELY!!! Gorgeous coloring!!! Great designs with the new Angie Girls, Rachel! Very pretty cards. Great stamps. Yup, that Shari Angie Girl is my fave, too. We dog lovers have to stick together! I'm afraid she'll be in my stamp collection before the weekend is over. Great cards, Rachel! I love your first card it's super cute. Love what you done with it! Lovely coloring, especially the jeans! Love the soft, pastel work on the first card too. Wow-a cute pup! love the projects you posted....and your coloring is spot on perfect! You got caught up in a hurry Rachel. Gorgeous cards (and I agree with on your FAV). Love your cards and I agree, the new Angie girl with the dog may just be my favorite! Such cute projects! The "Whitney" girl is so me...but I couldn't get along without my puppy! 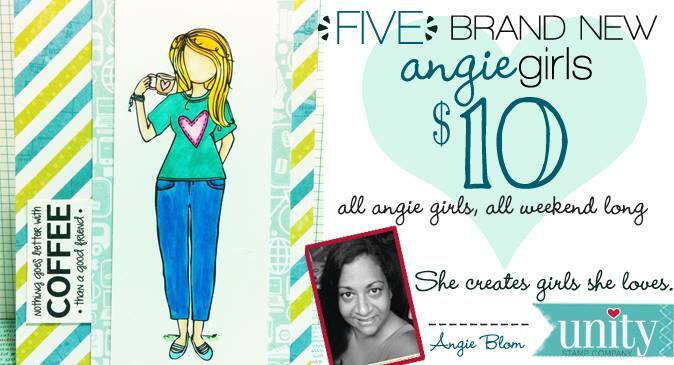 Gorgeous cards with these beautiful new ANGIEgirl designs! Your coloring is amazing! Love your paper choices too! Love every single beautiful design, Rachel! Your Meeko is pretty stinkin' cute too. Great coloring....and I LOVE that pic of you and your pooch - perfect!! Fabulous--my fave is the one in overalls. Love your cards. The overalls wonderful-someday maybe I'll get some Copic markers but for now I use my old ones. Thanks for sharing with us. How wonderful!! and I love the background papers. They're perfect! Such awesome cards! Great coloring on the overalls! the girls are so beautiful!! ans I shd say, Perfect coloring!! beautiful cards!! These are so pretty love them!! 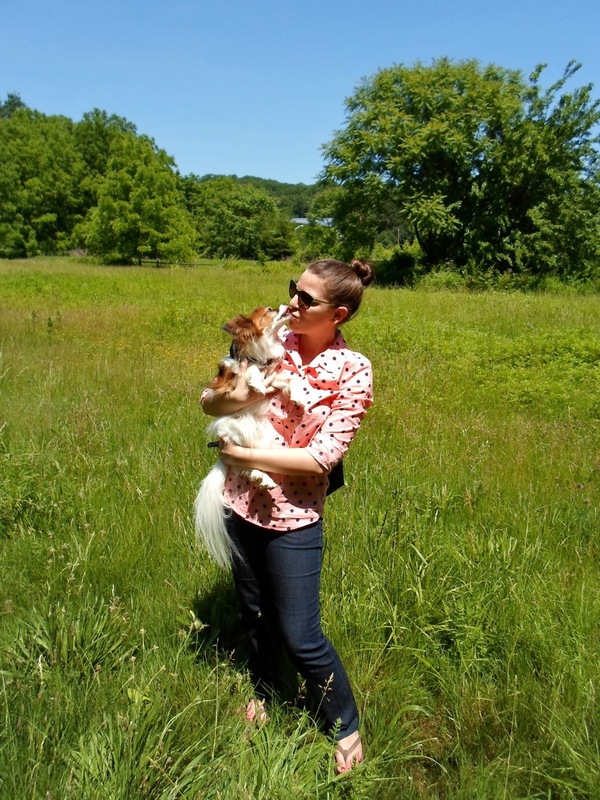 Gotta love a girl and her dog. So very cute. Love the flower child one since I myself love to garden so much. Great cards! Your coloring is very pretty on both! Love the Angiegirls, you did a great job with them! lovely work; i'm like you--love the dog one the most!!! Awesome cards. I too love the puppy card. I love my fur baby. I love SC paper you used.